A convenient 3-piece mini "Try Me" kits that restores the moisture to dry, dull hair. Best-selling products from Caviar collection available in convenient 3-piece mini "Try Me" kits. The perfect way to sample before committing to full-size products. • Replenishing Moisture Shampoo: Massage throughout wet hair and scalp. Rinse thoroughly. Repeat if necessary. Follow with Caviar Anti-Aging Seasilk Conditioner for best results. • Replenishing Moisture Conditioner: After cleansing hair, remove excess water and gently massage into hair and scalp. Rinse thoroughly. 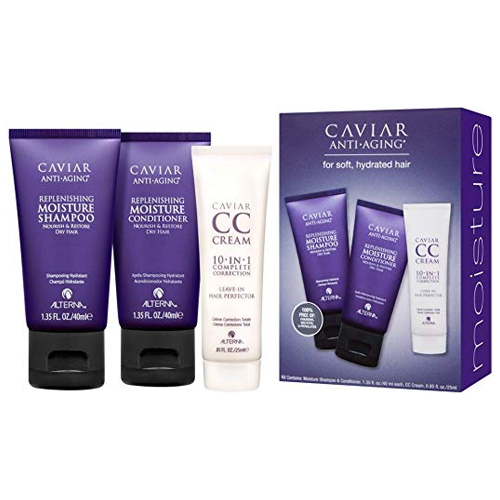 • CC Cream: Apply evenly to clean, towel-dried hair & style as desired. Can also be used as a finisher on dry hair for added perfection.